Stuff Points: Earn 33 points when you buy this stuff. A great way to get both of these products for one low price. 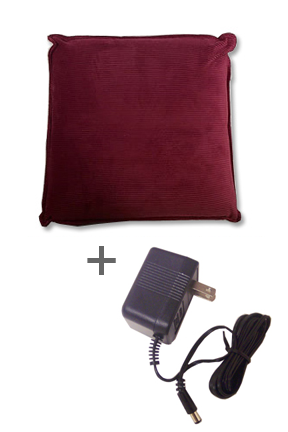 The AC adapter allows you to operate this pillow without using batteries. Simply insert the cord, and then plug into a standard wall outlet to enjoy non-stop vibration without ever switching batteries. 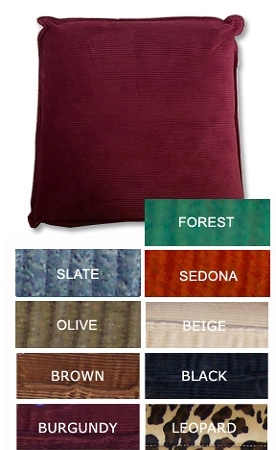 The decorative massage pillow has a durable cover available in several colors, and features two speed pulsating action. Just lean back to activate the pressure switch. When weight is applied, the pillow will turn on, and when you get up, it turns itself off. The varied speed and intensity of vibrations make for a soothing massage for your back, neck, feet or legs. These products can be purchased separately, but you save money when you get this combo. Dimensions (l x w) 2.25" x 2.25"
I love my pillow. Because of constant backache, I am able to get relief from the pillow. It really works. I highly recommend it to everyone. So relaxing. I got excellent customer service and have urged many of my friends to take advantage of this massage pillow. Thank you for your wonderful customer service. Received the massage pillow and couldn't wait to try it out. Works great if I lay back on it, but if I want to use it for neck/head/shoulders enough pressure cannot be placed on the pillow to activate the massage unit. It is not sensitive enough to use efficiently. Subsequently, for me I considered it a waste of money and would not purchase this item again. The first pillow I received did not work, I contacted the company and they sent out a replacement no questions asked. The replacement worked as it should. With my back problems this pillow is wonderful. Thank you. I have back problems and decided to invest in a good quality Pillow,. this pillow kneads (like bread) and vibrates at the same time,it's strong And effective .It arrived it it's own plastic shapable cover safe and sound! I had a very fun conversation with the coustomer survive person,When I leaned back it wouldn't start at first,with use it's just great! !I am waiting for some coolers to back in to bye more! I Highly recommend this massage PILLOW!!! My massage pillow stopped working. What are my options? If you haven't changed the batteries, definitely try that. If you have power connected via batteries or AC adapter, then the switch or motor may be damaged or defective. Inspect the pressure switch to make sure it is functional, and determine if the motor engages or not when it's pressed. For further assistance, please give us a call.